Below are airport shuttle, taxi, and limousine options from Honolulu International Airport to The Royal Hawaiian, a Luxury Collection. Rent a car in Hawaii with Avis. The SPG Waikiki Airport Shuttle provides the most convenient mode of transportation between Honolulu International Airport (HNL) and The Royal Hawaiian, a Luxury Collection Resort. Start your vacation off with Aloha. Upon arrival, a friendly airport representative holding a Starwood / Robert’s sign will meet and greet you at baggage claim where porters will transport your luggage to the exclusive Starwood Shuttle. International Arrival guests will also be met at the baggage claim. 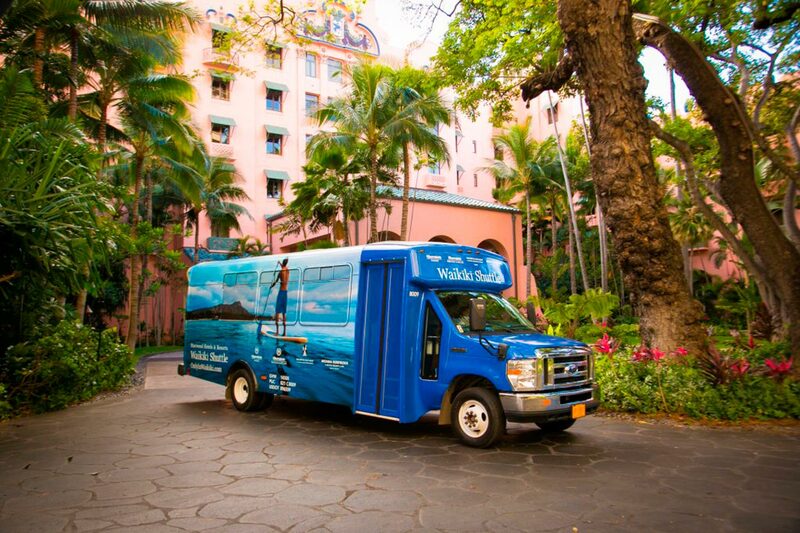 Starwood Shuttle exclusively services Sheraton Waikiki, Royal Hawaiian a Luxury Collection Resort, Moana Surfrider a Westin Resort and Spa, and Sheraton Princess Kaiulani Hotel. depending upon traffic conditions, passenger count and stops. All reservations must be made no later than 6:00 pm the day before your service date. All reservations are subject to availability. Book shuttle reservation (powered by Roberts Hawaii). All of the above information is based upon the latest confirmation provided by transfer companies and the Honolulu International Airport. *All prices and travel times are estimates and subject to change. There are taxi dispatch personnels meeting all arriving flights. Taxis range in size from sedans to vans. 30-40 minutes, depending on traffic*. Approximately $45.00 to $55.00 (gratuity is not included) depending on traffic*. One of the preferred vendors providing quality Limousine and Luxury Sedan transfers is Platinum Limousine. For rates, more information and to make a reservation, please call our resort at (808) 923-7311 and request to be directed to our concierge team.